Daniel 11:33 - How cruel can men be, acting in Gods name? By Alberto Rivera a former Jesuit priest in the Roman Catholic church. 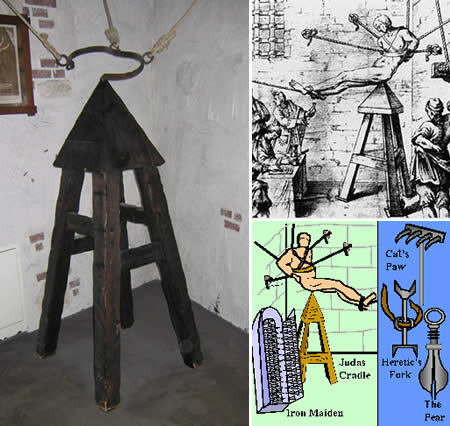 He describes how the Jesuits still use torture as a way of persuading people today. 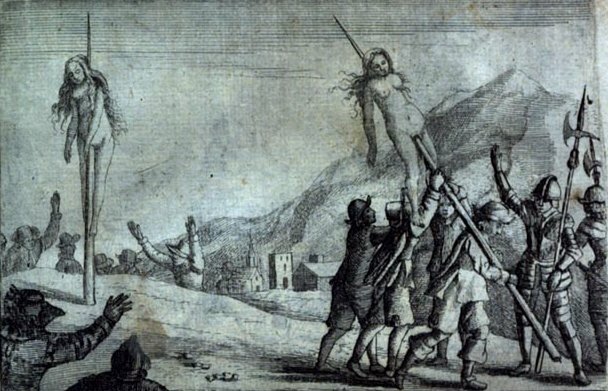 Christian women impaled alive by Roman Catholics soldiers in the Piedmont valleys. The women can hang on the stakes for many days before dying. John Wycliffe 1329-84, professor at Oxford University, formed the Lollards (disciples) at his church in Lutterworth, England, and they distributed his translation of the Latin Vulgate Bible into the English language. Johan Huss 1374-1415, Roman Catholic professor at Prague University, Bohemia, (Czechoslovakia). Jerome of Prague 1365-1416, Reformer from Bohemia, (Czechoslovakia). Martin Luther 1483-1546, Roman Catholic professor of Wittenberg University, Germany, who translated the Bible into the German language. He influenced Denmark, Sweden, Norway and France. Ulrich Zwingli 1484-1531, Roman Catholic reformer from Switzerland. John Calvin 1509-1564. Roman Catholic reformer from Geneva, France. Martin Bucer 1491-1551. Reformer from Strasbourg. 1611 King James Bible in the English language. 1558 Mennonite Bible used by the Dutch. 1553 The Spanish Bible translated by Francisco de Enzinas. 1541 The Uppsala Bible Swedish translation. 1550 King Christian III Bible Danish translation. 1505-72 Reformer John Knox from Scotland. Mid 1500´s Anabaptist from Germany. 1685- Huguenots from France persecuted by King Louis XIV. Dan 11:33a. they stumble in sword and in flame/fire in captivity and in plunder many days. This is the period in papal history where they persecuted all Christians that followed the reformers in the reformation for the following 300 years. The papacy persecuted all heretics and dissenters from the Roman Catholic Church. 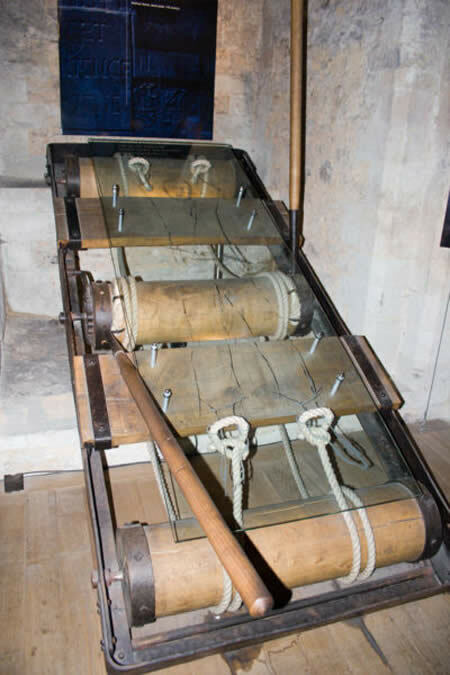 This instrument is called the rack and was used to pull the legs and arms apart from the body while the person was alive. Bible texts related to the persecution period during the Middle Dark Ages. (457 B.C- 1844 A.D.) Dan 11: 24. He shall destroy the mighty and also the holy people. He shall destroy many in their prosperity. Mat 24:9. Then they will deliver you up to tribulation and kill you, and you will be hated by all nations for my name´s sake. Verse 21. Then there will be great tribulation, such as has not been since the beginning of the world until the time, no nor ever shall be. Verse 29. Immediately after the tribulation of those days (Middle Ages 538-1798 A.D.) the sun will be darkened and the moon will not give its light, the stars will fall from heaven – – -. Rev 13:5 The Beast was given authority to continue for 42 months (538-1798 A.D.) Verse 7. It was granted to him to make war with the saints and to overcome them. Rev 11:3 And I will give power to my two witnesses, (Old and New Testament) and they will prophesy 1260 days (538-1798 A.D.) clothed in sackcloth. Rev 11:7.8. When they have finished their testimony, the beast that ascends out of the bottomless pit will make war against them, overcome them, and kill them. And their dead bodies will lie in the street of the great city which spiritually is called Sodom and Egypt, where also our Lord was crucified. (During the French revolution 1798 A.D.). Some examples of the atrocities that occurred under the papal persecution of the reformers by J. A. Wylie a protestant minister in the Anglican Church. The man named Borelli, at the head of an armed troop, broke suddenly into Pragelas, meditating the entire extinction of its population. The miserable inhabitants fled in haste to the mountains, carrying on their shoulders their old men, their sick, and their infants – – -. In their flight a great many were overtaken and slain – – -. Without shelter, without food, the frozen snow around them, the winter´s sky overhead, their sufferings were inexpressibly great. When morning broke what a heart rendering spectacle did day disclose. Of the miserable group the hands and feet of many were frozen; while others were stretched out on the snow, stiffened corpses. Fifty young children, some say eighty, where found dead with cold, some lying on the bare ice, others locked in the frozen arms of their mothers, who had perished on that dreadful night along with their babies. Pope Innocent VII bull invited all Catholics to take up the cross against heretics; and to stimulate them in this pious work – – – it released all who joined the crusade from any oaths they might have taken; it legitimized their title to any property they might have illegally acquired, and promised remission of all their sins to such as should kill any heretic. In the train of this armed host came a motley crowd of volunteers “vagabond, adventurers, ambitious fanatics, reckless pillages, merciless assassins, assembled from all parts of Italy. June, 1488. The bull against the Waldensians invited all kings to gird on the sword and come to the help of the church in the execution of so total and complete an extermination of her enemies – – -. The joint army numbered about 18,000 regular soldiers. This force was swelled by the thousands of ruffians previously mentioned – – -. The Piedmontese division directed their course towards the Valleys on the Italian side of the Alps. The French division marching from the north, advanced to attack the inhabitants of the Dauphinese Alps, where the Albegensian heresy – – – had begun to take root again. The French division was led by a daring and cruel man – – – Lord of La Palu. He ascended the mountains with his fanatics, and entered the Vale of Loyse, a deep gorge overhung by towering mountains. The inhabitants upon seeing the soldiers climbed up the slopes of Mount Pelvoux 6,000 feet high to escape them. They came to an immense cavern half way up and hid inside it. The soldiers made a big bonfire at the entrance to the cavern and smoke entered the cavern and killed 3,000 the entire population of Val Loyse. Among them 400 infants suffocated in their cradles, in the arms of their dead mothers. Those who tried to escape from the cavern were put to the sword. The place is the Nuremburg Castle, Germany. In the Inquisitions torture chamber was the Iron Lady. It was a vaulted chamber dug out of a rock and contained an iron image of the virgin (Mary). On the instant of touching a spring, the image flings open its arms, which resembles the doors of a cupboard. (The door has a number of knives about one foot long protruding from it). Some of these knives are so placed as to enter the eyes of those whom the image enfolded in its embrace, others are set so as to penetrate the ears and brain, others to pierce the breast, and others again to gore the abdomen. The person who had passed through the terrible ordeal of the torture chamber, the rack, irons, etc. But made no recantation – – – would be led into the arms of the iron Virgin – – – the Virgin closed upon the victim – – – the spiky arms of the Virgin slowly but irresistibly closed upon the man cruelly goring him. When the man or woman was dead, the door of the Iron Virgin was opened and the corpse was cast into a pit in the ground leading to a canal which flowed to the Rhine. (We shall only quote part of the brief summary of what happened in the Muston Waldensian Valleys). 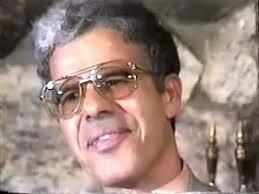 There is no town in Piedmont, says he, under a Vaudois pastor, where some of our brethren have not been put to death. Hugo Chiamps of Finistrelle had his entrails torn from his living body, at Turin. Maria Romano was buried alive at Rocco, Patia. Susan Micheline was bound hand and foot, and left to perish of cold and hunger at Saracenea. Bartholomew Fache, was gashed with sabers and had his wounds filled up with quicklime, and perished thus in agony at Fenile. Daniel Michelini had his tongue torn out at Bobbio for having praised God. James Baridari perished covered with sulphurous matches which had been forced into his flesh, under the nails, between the fingers, in the nostrils, in the lips, and all over the body, and then lighted. Daniel Revelli had his mouth filled with gunpowder, which being lighted blew his head to pieces. Maria Mannen was taken at Liousa, and had her flesh cut from her cheek and chin bones, so that her jaw was left bare, and she was thus left to perish. Paul Garnier was slowly sliced to pieces at Rora. Sara Rostagnal was slit open from the legs to the bosom, and left to perish on the road between Eyral and Luzerna. Anne Charbonneir was impaled and carried thus on a pike, as a standard; from San Giovanni to La Torne. Daniel Rambaud, at Paesano, had his nails torn off, then his fingers chopped off, then his feet and his hands, then his arms and legs, with each successive refusal on his part to abjure the Gospel. Thus the roll of martyrs run on, and with each new sufferer comes a new, a more excruciating and more horrible mode of torture and death. Having read these horrific tortures and deaths, one can ask the question: How can a church, who believe in Jesus Christ, stand behind such atrocities? The answer is, they did not believe in Jesus Christ of the New Testament. 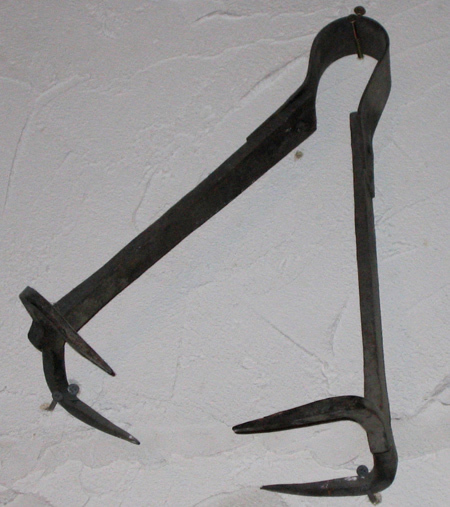 This instrument is called the knee splitter. There were two groups in the Roman Catholic Church which helped the pope to exterminate Christian heretics and dissenters of the church. The first was the Inquisition and the second was the Jesuits. (Lyons 318). The Dominicans during the 12th century were to become the foremost order of the Inquisition. Innocent III was the first pope to talk about heresy in terms of treason in 1199 A.D. Pope Honorius III allowed the Albigensian (Cathar) Crusade to intensify. Emperor Frederik II had issued a similar decree in 1220 and in 1224 he ordered the burning of heretics. Execution by the secular authorities had finally and officially become papal policy. Under Gregory the Inquisition as a church institution was practically completed. Pope Innocent IV issued a bull “Ad extirpanda” 1252 – – – condoned the use of torture in the Inquisition. 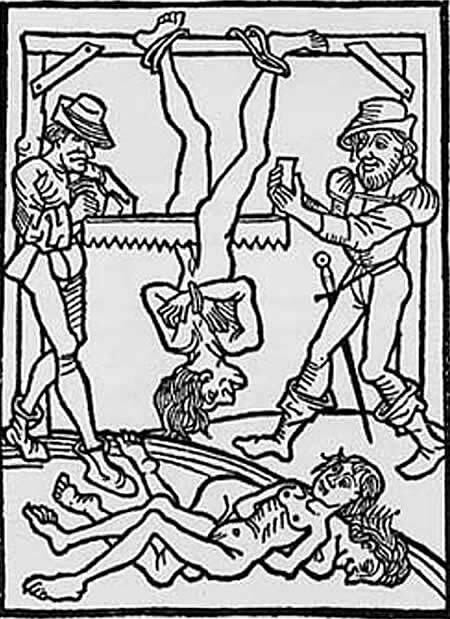 The Inquisition was made up of several officials who assisted inquisitors in various ways: delegates – examiners who handled preliminary investigations – the socies – a personal advisor and companion to the inquisitors –familiars –guards, prison vistors and secret agents – notaries who collected evidence of suspected heresy. The Bishop too would be represented. (Lyons 318.319). General Inquisition:- The inquisitor would arrive suddenly and deliver a sermon to the townspeople calling for reports of anyone suspected of heresy – – – to come forth and confess within a period of grace. When the period of grace expired, the special inquisition began, with a summons to suspected heretics who were detained until tried. The suspect was not allowed a defence lawyer. Trials might continue for years, during which the suspect could languish in prison. Torture was a most effective means to secure repentance. Death at the stake was entrusted to the secular authorities, which pronounced and carried out the sentence, since the church could not shed blood. The Inquisition was a combination of papal and civil authorities. (Walker 232). Inquisition proceedings were kept secret. The confiscation of the convicts/heretics properties were shared by the lay authorities, this feature undoubtedly kept the fires of persecution burning, where otherwise would have died out. (Lyons 411). The other group which helped the papacy fulfil their bull of persecutions are the Jesuits. Who are the Jesuits? Ignatius Loyola founded the dedicated and powerful Society of Jesus (the Jesuits). Ignatius, a Spanish nobleman, was born in 1491 or 1495 at the castle of Loyola near the Pyrenees. He was a professional soldier. He was wounded in 1521; while convalescing resolved to become a soldier for Christ. He spent one year at the Manresa monastery and here he drafted his “Spiritual Exercises”. He and six friends vowed to practice poverty and celibacy. In this way the Society of Jesus began. They vowed total obedience to the pope as commander-in-chief and Ignatius became general under him. (Lyons 413). All of its leaders were appointed by the general for life. The constitution imposed no special religious uniform. 15 years of training was quite normal to become a Jesuit. (Lyons 411). The Spiritual Exercises were a form of four week retreat programme of devotional meditations and instructions. Week one was on sin, week two on Christ´s kingship, week three on his passion and week four on his risen life. The aim was to achieve complete and realistic consecration. (Lyons 413). By 1556 there were over a thousand Jesuits mainly in Spain, Portugal and Italy, but also in France and Germany. By 1626 there were 15,544 Jesuits and they worked in almost every corner of the globe. Jesuits reached a peak of 36,038 members in 1964. Education quickly became the most important Jesuit emphasis. By 1626 the Jesuits had 400 colleges. These schools were open to all classes of people and generally charged nothing for tuition. Jesuit education was based on the plan of studies from 1599 and it purified and simplified Renaissance and Humanism. Philosophy in their schools generally followed Aristotle. Theology was freely adapted from Thomas Aquinas and their schools were famous for their drama. Today the Jesuits run about 4,000 schools including eighteen universities in the United States of America. (Lyons 414). Loyola did not found the Jesuits in order to combat Protestantism. But this became a Jesuit goal, increasingly during the 16th century. Several Jesuits served as Papal representatives (legates) in complex negotiations to link countries more firmly to Rome for instant Ireland, Sweden, and Russia. Other Jesuits served as court preachers and confessors to the Emperor, kings of France and Poland, and the Duke of Bavaria. Peter Canisius and Robert Beldarmine wrote anti-Protestant works of theology. (Walker 519). Louis XIV´s policy was determined by his conception of national unity and Jesuit influence, especially after his marriage to Madame de Maintenon in 1684. In 1685 he revoked the Edict of Nates and Protestantism became illegal under the severest penalties. (Walker 520). The ultimate result was disastrous for France. Thousands of its most industrious citizens emigrated to England, Holland, Germany and America. These were mainly Huguenots. The former alliances with Protestant powers were ruptured, contributing much to military failures of the latter years of Louis XIV´s reign (and contributed to his downfall). The Jesuits infiltrated many governments and royal courts and influenced decisions made towards Protestantism, for the negative. This policy became their main combat against the Protestant reformation. 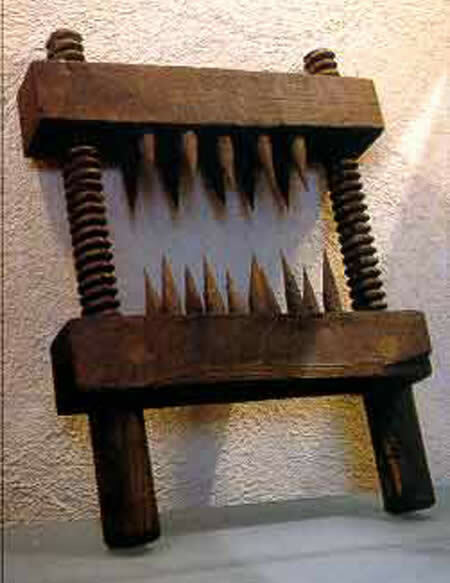 This instrument was used to rip the breast from a woman´s body while alive. How many heretics and dissenters were killed during the 300 year persecutions? It is very difficult to put a figure on how many were put to death under the 300 year Reformation. Many deaths by the crusaders (not crusaders against the Saracens) used by the papacy to extinguish heretics in Europe were not recorded. Many deaths involved whole armies that were slaughtered e.g. Huguenots in France were not recorded. Many civil authorities condemned dissenters and heretics to death because they wished to plunder their houses, lands and riches. These were not recorded because the authorities did not want any trace of the false trials left to the scrutiny of others in the future. So how many were killed? John Wesley in his book “Doctrine of Original Sin” Part 1, section II. 8. 1757 Wesley´s Works, Ed by Thomas Jackson, states that 45 million died under popery since the Reformation. David A. Plaisted has done a 9 chapter well founded study on the “Estimates of the number killed by the papacy in the Middle Ages and later”. 2006. Plaisted has studied the origin of many numbers reiterated by Protestants and Roman Catholics. He has studied the religious wars, the Spanish Inquisition, population growth and death from plagues all over Europe. Plaisted in his conclusion states “that the death toll due to persecution in the Middle Ages is astronomical and many times larger than 50 million”. Many of these deaths were true believing Christians belonging to the Roman Catholic Church who just wanted to follow the Bible which is God’s word. The papacy however was against this and therefore extinguished many millions of lives. I am afraid if the papacy came to power again, history will repeat itself in the future because the papacy has never removed their negative policy towards heretics from their books, and if they ever came to power again they would continue with the same policy. 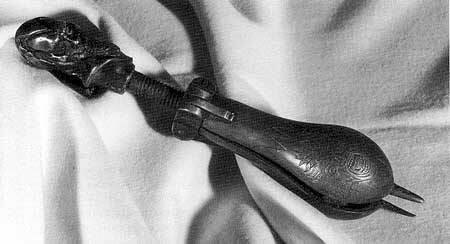 This instrument is called the pear and was used to be inserted inside a person´s mouth. As the screw was tightened, the pear was opened so as to break the persons jaw while they were alive. J. A. Wylie, The History of Protestantism (London: Cassel & Company Ltd., 1899), 434.